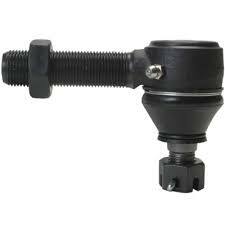 The tie rod end is a car’s suspension part. It is a small joint that connects the wheel to the steering rack and helps the car turn when you are turning the steering wheel. You have one of each side of the front tires. When you drive a car, you expect the car to drive straight as an arrow unless you command it to turn left or right. The tie rod prevents that from happening. It restricts the car’s movement and facilitates it at the same time. Usually, it is the rubber bushings in a tie rod that need replacement(older cars, newer you have to replace the tie rod) but since the whole system is being worked constantly, the tie rod can come under severe strain and fail. When this happens, you will notice some big changes in the way your car drives. It would be best to know when these changes happen, so you can solve them before any major mishap. The tie rod end is not connected to a car digitally, so you won’t see any warning signs flashing on your dashboard. However, there will be other symptoms on the show if you keep a keen eye for them. The tie rod is supposed to keep your car straight and aligned. But even though other suspension components such as the sway bar, struts, shock absorbers and stabilizer bars play a huge role in determining wheel alignment, any change in the tie rod’s performance can really distort your front wheel alignment. If you feel your car is moving unnecessarily to the left or right while you are braking or while your car is in motion, the tie rod could probably be going bad. The good thing about suspension components is that you can feel their performance right up to the steering wheel. So, if any component like the tie rod is underperforming you can feel its sensation in your hands. The tie rod is directly connected to the steering housing, which means any movement you make with your hands is being mimicked by the tie rod down below causing the car to steer. Therefore, if you are feeling your steering is unresponsive or jittery, your tie rod might have an issue. You might feel the steering wheel bouncing or shaking violently at high speeds, which is what happens when a tie rod is loose. This could easily mean a problem with any other suspension part such as the shock absorber, so it is best to get it checked by a mechanic. When the alignment is off-balance due to a loose tie rod, the tires feel the most effect. At the end of the day, it is the tires that are taking all the friction from the road. So, if after some time you notice a particular area of the tire is wearing out, there is something wrong with the suspension components and the tie rod is probably the main cause. The uneven tread depth is a tell-tale sign of this kind of issue. Tie rod ends are not very difficult to repair. In fact, they can be repaired with the proper tools and knowledge at home. However, it always better to seek the services of a mechanic in emergency cases. Newer cars you do normally have to replace the whole tie rod as the bushing replacement inside them are not available to replace. After you have applied all the necessary solutions and they have failed, the last resort is to either replace the tie rod end with a new one or repair your old one. You will be surprised, to learn that repairing a tie rod end is not rocket science. All it requires is a few handy tools and time. Once you are able to dismantle the suspension, detaching the tie rod is a piece of cake. After you have accomplished that, simply clean the tie rod ends very thoroughly and apply grease to the joints. Grease is a useful agent that reduces strain on metal parts. Once you have done all that, install new bushings and you are good to go. However, for those who are not into repair work, the mechanic is always an option. And repairing a tie rod does not cost much since it is not labor-intensive work. Expect to be charged around $70 to $150 for the labor. Replacing a tie rod end is also not a big deal, but the cost or replacement depends on a few factors. Firstly, tie rods are made of heavy duty material like iron or steel, therefore they are not easily broken. So, no matter how much you try to find, it is very rare to see a broken toe rod case. But here we are looking at cases when it can happen. And don’t be fooled, it can happen. When that occurs, the price you pay is dependent upon the type of vehicle you drive, the make of your vehicle and the model. Once that is determined, it is time to find the part. Spare parts are not easily available if your vehicle is old and for new vehicles they are expensive. Generally speaking, a tie rod end will cost you $100 to $250 plus the cost of labour. It could be possible that you are unnecessarily blaming the tie rod ends for your jittery and unresponsive steering wheel. You could simply go to a mechanic who has a computerized wheel alignment machine. Your car will be fixed in no time. Thereafter, if you are still feeling the same symptoms, it is time to call the mechanic. Remember that you should always get your wheels aligned after a tie rod replacement. Taking your car to the service station regularly can also ease the stress on your tie rod. This part goes through a lot of wear and tear when the car is in motion, so you are expected to give it a break. General servicing can ease up the tie rod joint if the mechanics are applying oil and grease to the joints. This was more common on older cars, new cars you have to replace the tie rod. However, these solutions are only temporary and to avoid any untoward accident in the future it is advisable to visit the mechanic and get your tie rod ends repaired or replaced. It’s always recommended to replace a bad tie rod.